Madrid is the capital and largest city of Spain. 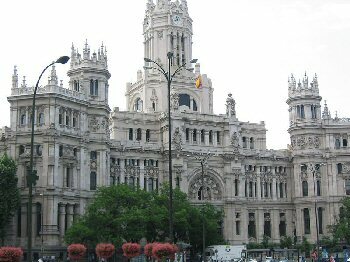 ; ; As the capital of Spain, Madrid is a city of great cultural and political importance. While Madrid possesses a modern infrastructure, it has preserved the look and feel of many of its historic neighborhoods and streets. Its landmarks include the huge Royal Palace of Madrid; the Teatro Real (Royal theatre) with its restored 1850 Opera House; the Buen Retiro park, founded in 1631; the imposing 19th-century National Library building (founded in 1712) containing some of Spain's historical archives; an archaeological museum of international reputation; and three superb art museums: Prado Museum, which hosts one of the finest art collections in the world, the Museo Nacional Centro de Arte Reina Sof?a, a museum of modern art, and the Thyssen-Bornemisza Museum, housed in the renovated Villahermosa Palace.